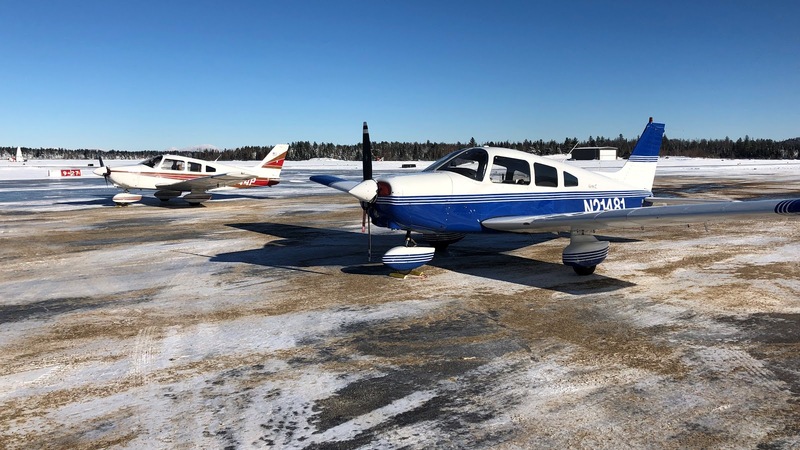 On a frigid morning of 12°F, the cold-soaked Williamson Sodus Airport gradually awoke from hibernation as three aircraft were readied for flight. Despite an overhead ceiling of 1,500 feet, radiant light from the sunrise spilled across the field from a clear sky to the east. At 8:00 am, a Warrior, an Archer, and a Cirrus departed in trail, noses pointed toward high pressure air prevailing over the Adirondack Mountains. Me and Paula at Saranac Lake. Photo by Tom. Our destination was the Adirondack Regional Airport (KSLK) in Saranac Lake, NY. Just east of Sodus, Paula and I broke out from under the cloud deck in Warrior 481 and climbed into the clear sky. It would only be my second time visiting Adirondack Regional; the first was almost exactly twelve years earlier in January of 2007. That day, I stopped for lunch at Paula's Airport Cafe (no relation to my passenger). The food was adequate but unexciting and I had made no effort to return. 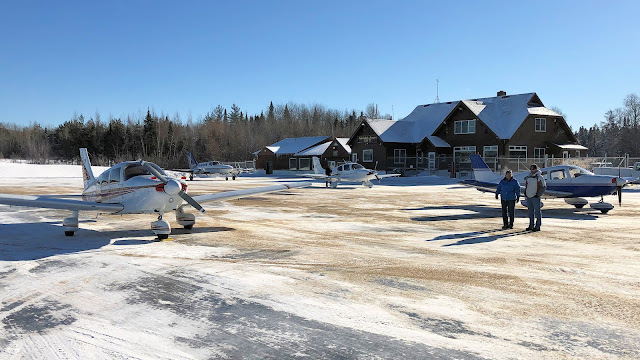 Our mission that morning, aside from getting the airplanes into the air, was to sample the ADK CAVU Cafe that supplanted Paula's. Adirondacks looming in the distance. The evergreen forest below appeared to be well frosted. 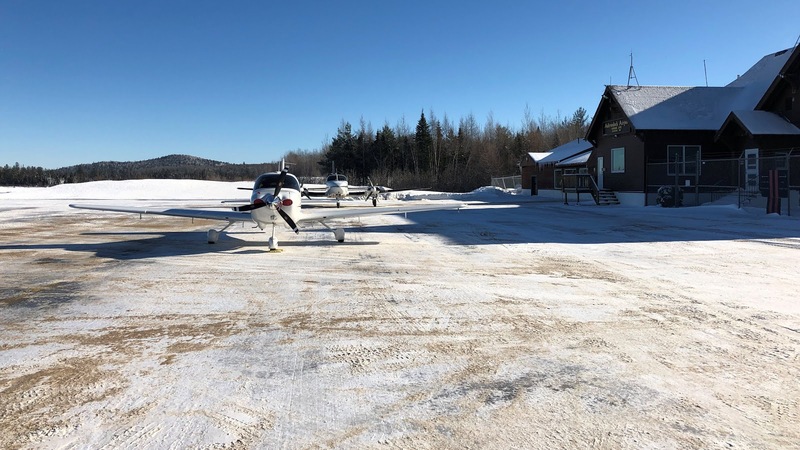 On approach to Saranac Lake, the frosted landscape below sparkled under a crisp cobalt sky. The region was so perfectly centered under a high pressure system that the air was absolutely still. It was glorious flying weather. Despite being named Adirondack Regional, the airport is generally in flat country west of the mountains. On arrival, with the brilliant sun shining down and the lack of wind, it was not immediately obvious to me how cold it truly was: -6°F. Clearly, the cold of Rochester had nothing on the sort of cold one finds in the north country. Regardless, it was a spectacular day. I stuffed cowl plugs into the snout of the Warrior in hopes of retaining some heat in the engine compartment and requested fuel from the line crew that parked our trio of airplanes. The ADK CAVU Cafe is in the terminal building and needs to be accessed from the street side of the fence. To get there, we exited the ramp through the FBO. A member of the line crew explained to me that the Cafe owner trained as a professional chef and his wife, who was our waitress that morning, had a business degree. Between the two of them, the Cafe had prospered. Although we were the only fly-ins that morning, the restaurant quickly filled with locals, which is always a good sign. More than half of us ordered the biscuits and gravy - it was just that kind of a morning. Our food was good and the service was friendly. I will certainly be back. Brad, Paula, me, Natalie, Ed, and Tom. Photo by "Tom". 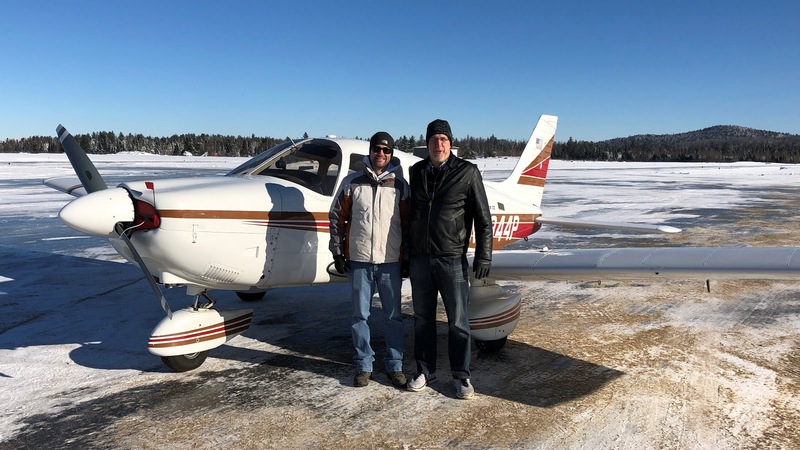 I needed to be back home by 1:00 and everyone was conscious of the aircraft engines cooling off outside in the cold air (the temperature rapidly rose to -1°F over breakfast), so we did not dawdle in Saranac Lake. The flight home was just as beautiful as the early morning ride. Flying at 8,500 feet, we had the rare ability to peer far back into the geologic past. Parallel striations etched into the terrain conjured a powerful mental image of the land being scoured by a glacier. At least, it did for me. I can't speak for anyone else. Contrary to forecast, the low clouds over Sodus from that morning did not dissipate. When we returned to the Lake Ontario shore, a low deck extended onto shore from the great lake. 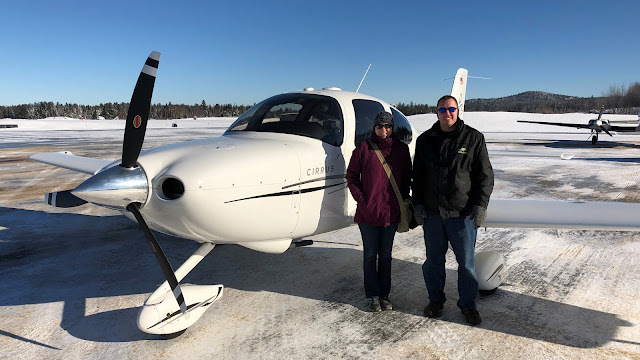 Ten miles out from Sodus, we ducked underneath to find our home airport with marginal VFR ceilings and good visibility in light snow, though visibility dropped quickly west of the field. Beneath the gray overcast, it seemed that we had arrived on a different planet after our time in the sun that morning. Overall, we had a wonderful flight with the added bonus of sampling a new airport diner. Oh, the "sacrifices" we make to keep our aircraft engines well-lubricated and happy during the winter. Dynamic weather is a constant adversary of pilots, challenging decision making and ability. In my thirteen years of living in Upstate New York, I have seen January present the most consistently inconsistent weather patterns of the year. January weather arrives stealthily and often shrugs off our forecasting attempts. During the first few weeks of each year, it can be tempting to ascribe willfully sinister motivation to the weather. 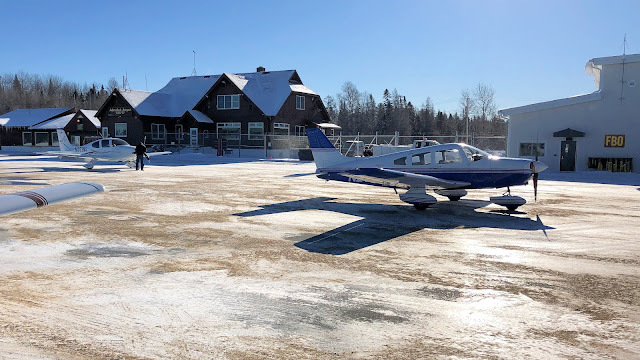 For these reasons, I usually stay close to home in January and most of my landings are at airports in the local area. Even with such a hedge, surprises still occur. Cold morning air filled the vast dome of clear blue sky, the biting chill held at bay by aluminum skin, Plexiglas, and indirect heat from the Warrior's powerplant that produced an artificial bubble of warmth in the winter atmosphere. A tiny black dot off my left wingtip was a Piper Colt carrying Lee and Mike to our breakfast destination in Dansville. Despite clear conditions, weather was anticipated to move in hours later, but our breakfast excursion would be long over by then. The most exciting moment en route came when another pilot flubbed a readback to Rochester Approach. "Sir, you need to pay attention," the approach controller lectured the nameless pilot sternly. "You have screwed up every readback you've made this morning." I make it a personal goal to avoid having these kinds of comments directed at me. Finished with breakfast, we were dawdling in the restaurant in the thick of aviation-themed conversation when Mike's eyes suddenly widened as they focused out the window behind me. Low scud had rolled over the Dansville airport, catching us in a proverbial state of fat, dumb, happiness. We hustled back to the airport and surveyed the conditions. Low clouds were sliding in from the northwest and the departure course off runway 32 was completely socked in. Clear blue sky still prevailed beyond the airport boundary off the departure end of runway 14 to the southeast. 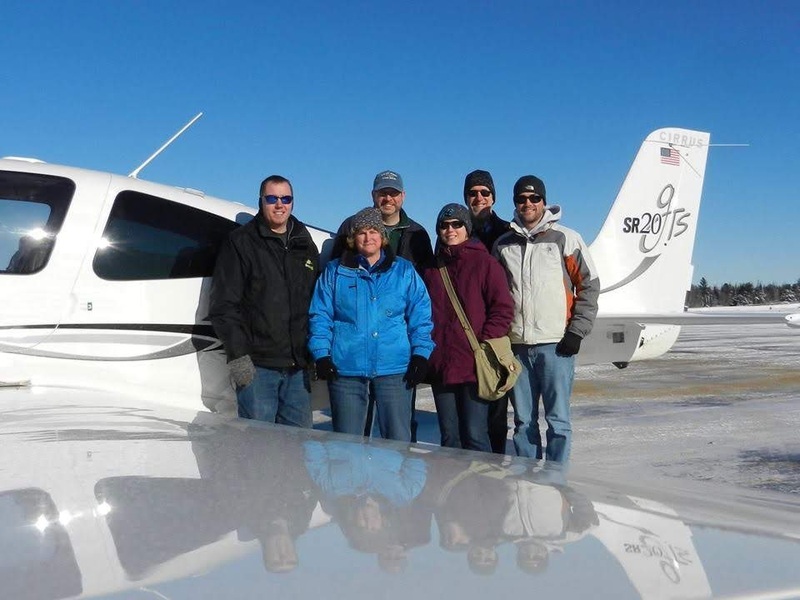 For VFR traffic, Dansville had become a one way airport. Per the ASOS, the ceiling was 600 broken with a visibility of seven miles and light wind out of the northwest. With the Colt departing first, we launched downwind from runway 14. It was the most marginal VFR departure I had ever made, but perfectly legal given the Class G airspace extending to 700 feet above the ground (Class G daytime VFR requirements are 1 mile visibility and remaining clear of clouds). As soon as I cleared the airport boundary, I was back under clear blue sky and climbed to a suitable cruise altitude for the flight home to Sodus. We escaped just in time. At altitude, the view beyond the Warrior's windows took my breath away. During our brief breakfast, a stealthy and premature ceiling slipped in and seemingly covered the entire world. En route home, Canadiagua was IFR in fog while Sodus still reported a clear sky. However, radio chatter around Sodus made it clear that weather was moving in at home, too. Ten minutes out, the AWOS began calling scattered at 1,000 feet. "Put the coals to it, Lee," I suggested over the radio to my friends in the slower Colt. I took comfort in knowing that I could simply request a pop-up IFR clearance if the field went IFR before I arrived, but that would not be an option for Lee and Mike. "Give me a call if you have to divert - I'll come get you." Fortunately, I could also hear VFR radio traffic at Skaneateles to the southeast, indicating that there were safe VFR harbors in that direction. 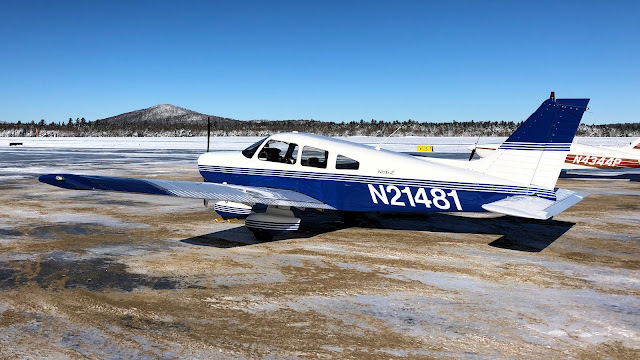 I landed with several other aircraft whose pilots were throwing in the towel for the day, every one of them snookered by the unpredictable January weather. With the engine shut down in front of my hangar, I waited in the Warrior with the radio powered until I heard Lee announce that he was on final approach with a landing assured. All pilots know that one of the most crucial tools for understanding weather is a window because it provides a reality check on anything we might believe from a forecast. Thankfully, the restaurant that morning had one and it was pointed in the right direction.